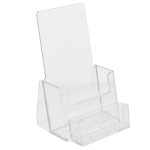 The Countertop Model Single Pocket Half-Page Brochure Holder / Business Card Holder Combination creates a multi-purpose, inexpensive display. 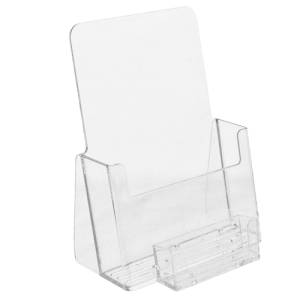 Attaching the gift card/coupon card/business card holder puts your information up front. 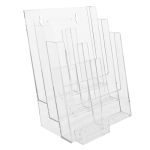 Our unique design is easy and effective to maximize your visual display in a small space. 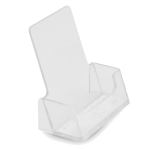 Our proven design does not use tape or glue, ensuring a perfect, secure attached pocket every time. The C6 Combo is ideal for tourism booklets, CDs and literature up to 6'' wide with an additional pocket for a business card, coupon, or gift card.